← Still waters and cloud in Eryri. The digital darkroom is our friend. It has been a dry and sunny October so far and our new solar pv panels have been getting an excellent work-out in the couple of weeks since they were installed. The landscape photographer has other priorities, of course, and wall-to-wall sunshine is not necessarily one of them, even in autumn. Earlier this week I managed twenty-four hours around the Mawddach estuary in north Wales – truly one of the UK’s most stunning locations. 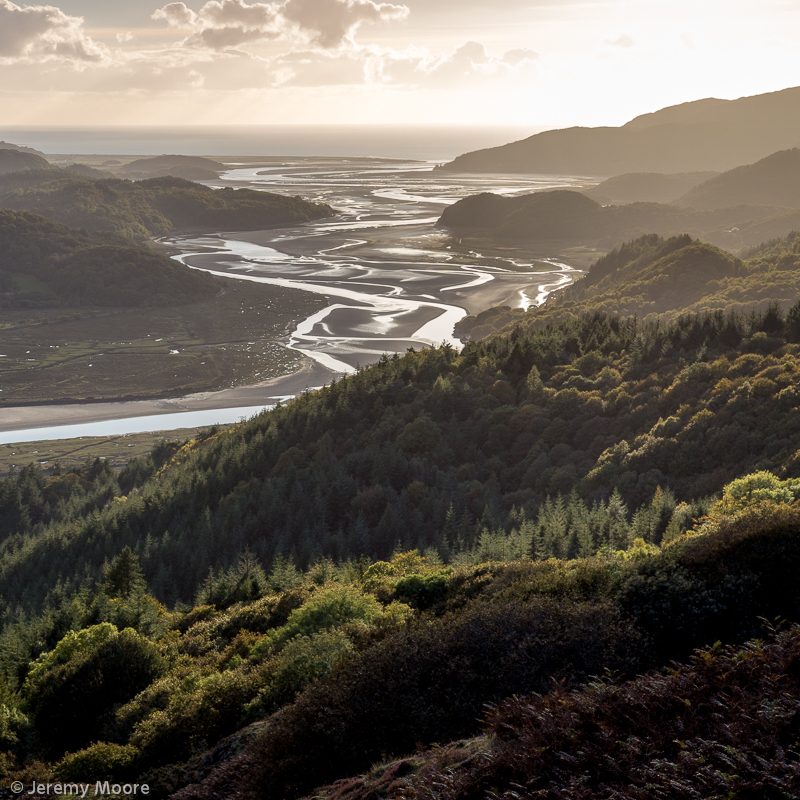 For the life of me I just cannot understand why more photographers don’t head for the Mawddach! Over the years I’ve got to know a few spots which are easy to get to and provide great views down or across the estuary and I suspect they make me a bit lazy. Why search for new locations when the ones you know so well usually deliver the goods? 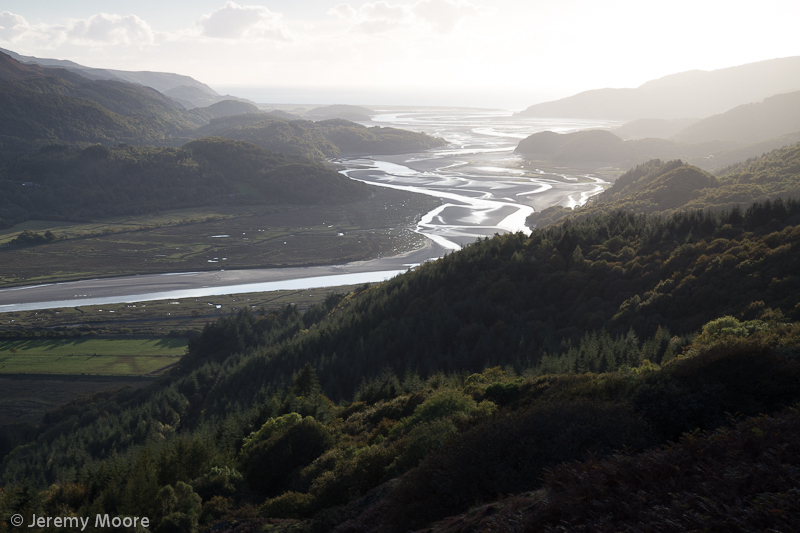 The first location I tried was the New Precipice Walk (Llwybr Foel Ispri), high on the north side of the estuary about two miles downstream of Dolgellau. It is possible to drive along a gated road to within a few minutes walk of this fabulous spot and I was there in good time for sunset on Monday. One needs to be aware of fairly subtle changes in the landscape as they take place; for just a few minutes the brilliant sun illuminated the estuary and its wooded banks without overwhelming the eye of the beholder. I could see the potential for a good image but only if extreme levels of contrast could be handled in some way. Stacking my 1- and 2- stop ND grads I took a few frames but the images looked very disappointing on the LCD screen. Messy and badly exposed. Why bother? Sunset itself proved to be a damp squib so that was that for the evening. Back home a quick look at the RAW files (see above) instantly confirmed my earlier judgement. But on a later viewing I had a play with the image using Lightroom’s development sliders – exposure, shadows, highlights, blacks and whites. Adding a square crop and a tweak to the colour balance, it only took a few blinks of the eye to come up with the top image, and I’m really pleased with it. The digital darkroom really is our friend! I spent the night at Cregennen Lake on the south side – another firm favourite of mine and subject of just the second post in this blog. It is a truly dark place and I spent a couple of hours searching the northern skies unsuccessfully for an aurora. Following a disappointing dawn at Cregennen I returned to Llwybr Foel Ispri. The first burst of autumn colour in August and early September is still accompanied by the vivid greens of summer. By the end of October and well into November trees lose their leaves in a riot of colour if we are lucky. But in between the colours of the autumn landscape can seem muted and rather tired. There’s a kind of tawny wash to it which doesn’t really inspire. Autumn colours and bright sunlight might seem to be a recipe for success but it’s not just a matter of turning up and pressing the shutter. I had no great expectations for this visit but realised I had two of everything in the van (tripod, camera body and lens). I decided to have a go at a selfie – or, to put it another way – photographing the landscape photographer in his habitat. Quite easily done when you have the gear with you and the time! It was great fun for a while and involved me running at full tilt from one tripod to the other as the self-timer wound down. The images needed some quite detailed processing – removing uneven saturation of the sky caused by a polariser for one thing – but once again Lightroom has done a great job. I also photographed myself in a Tai Chi stance at the same spot. If ever one needed an uplifting outlook this has to be the place. To follow Tales from Wild Wales, please scroll right down to the bottom and click Follow. This entry was posted in Uncategorized and tagged autumn, colours, estuary, landscape, lightroom, mawddach, photography, snowdonia. Bookmark the permalink. 2 Responses to The digital darkroom is our friend.